2. Model............................Model 812 Mountain Wagon. Stanley Steam Cars were made from 1897 until 1927 by the Stanley Motor Carriage Company in Newton, Massachusetts, USA. Their total production was nearly 11,000 vehicles. The "Mountain Wagons" were developed by F O Stanley to carry summer visitors 34 miles, uphill, from the railway station in Loveland, Colorado into Estes Park in the heart of the Colorado Rockies, where the Stanley Hotel still stands. This was a climb with gradients that few internal combustion cars cared to attempt at that time. The Mountain Wagons did it with ease and they were built from 1909 to 1917 for the Estes Park resort and other hotel operators. A large batch was also exported to the Philippines. 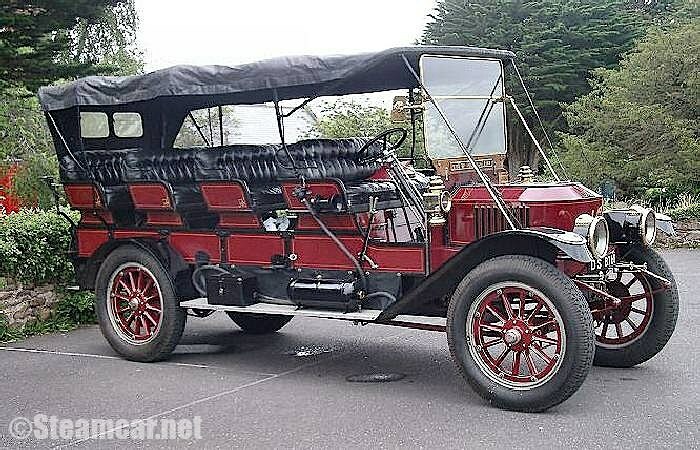 This particular vehicle was made in 1914 and sold to C L Jarrard of Berwick, New Jersey on 20th June that year. It is a model 812, 30HP Mountain Wagon with a 12 seater wooden body on an ash and hickory frame and chassis. The engine is a "de-tuned" and lower geared version of the famous Florida 127 mph power unit, capable of tremendous hauling power. The twin cylinder, 4 ½" x 6 ½" double acting locomotive type engine has Stephenson's link valve gear operating "D" slide valves. The engine is mounted with a direct gear drive from the crankshaft to the rear axle. There is no gearbox. Top speed is 55/60 mph, cruising at 25/35 mph and yet there are only 13 moving parts in the engine and a total of 24 in the whole vehicle. The engine turns less than twice (40:60) for each revolution of the wheels. The 26" diameter steel boiler operates at 600 psi and contains 999 copper tubes. It is hydraulically tested to 1100 psi. Feed water, after passing into the boiler through an exhaust derived heater, from a 90-gallon supply, needs replenishing about every 50 miles. The pilot light now operates on propane. The main burner is started with petrol at a pressure of 25 psi. but, when the vaporising tube is fully heated, then uses vaporised kerosene (or a diesel/petrol mixture) at a pressure of 140 psi. for the main fuel. Full boiler pressure is available about 30 minutes after lighting.